Here at A.D Welding & Fabrications we deliver high quality On Site welding Repairs & fabrication work quickly and efficiently. And equally Important at the most competitive price ! We offer practical solutions for any repairs / fabrications issue in the Marine , engineering , manufacturing , construction , and many other industries. Our complete service will assess every individual customer’s requirements and provide a full installation with unmatched expertise and application of technology. We have invested heavily on a state of art Multi process self powered mobile welding plant, so where ever you are ,on site or at your workshop we can weld all grades of steel , aluminium , stainless steel, cast iron and repair all kinds of plant and machinery and in fact any metal where ever is most convenient with minimal down time to you, Remember Down Time Costs Money ! Based on our location with Easy links to motorway routes in the south-east allow us to provide a fast On Site welding service to the whole of Kent , London , Essex , Surrey , Sussex , Eastbourne , Brighton. 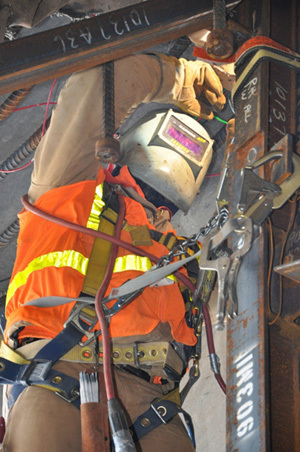 Our skilled and experienced team all have (CSCS) on-site welder cards. Using the very latest products and time saving techniques that gives us that vital edge in emergency welding repairs & fabrication . Whether your welding job is large or small , we'll be glad to hear from you and talk you through the whole process of how we can help solve your welding problem. Put us to the test !